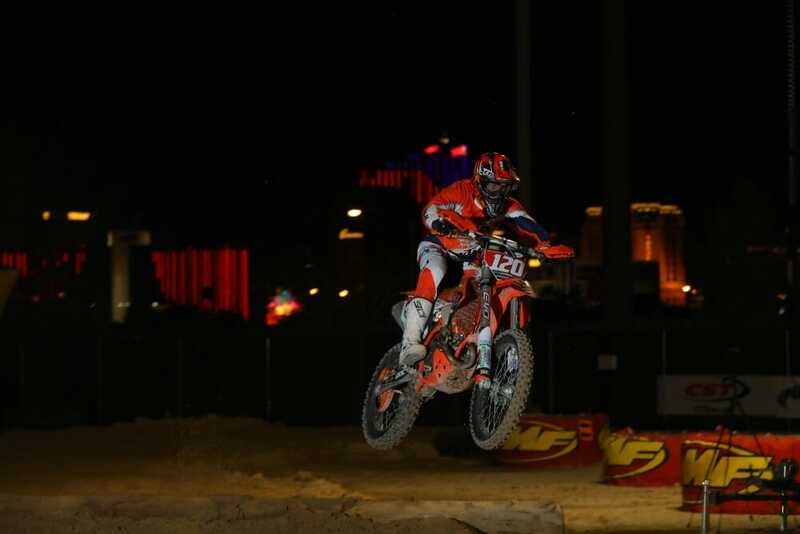 2018 Las Vegas WORCS Results – Taylor Robert, of the FMF/KTM Factory Off-Road Racing Team, scored the Pro-class win at the opening round of the 2018 Rocky Mountain ATV-MC WORCS Series in Las Vegas, Nevada, May 3. Robert got out front early and no one could do anything to change that, not even defending champ Gary Sutherlin, or young gun Ty Tremaine, though they both gave it a good effort, especially Tremaine who challenged Robert for much of the first half of the race. Robert had at least one close call when a lapper inadvertently tried to take him out. But Robert shook it off and continued about his business of winning the race. This was the only hiccup in Robert’s romp to victory in which he took the checkered flag approximately 40 seconds ahead of Factory Alta Motors-backed Tremaine, who was on board a gas-powered Husqvarna for this race. The Vegas race is unique to the championship in that dirt is hauled in and run on an entirely man-made racetrack that utilizes both the inside of The Orleans Arena and its surrounding parking lots. And, for the pros, it takes place under the lights. Lap times were in the low one-minute, 40-to-50-second range for the top riders; Robert’s best laps were in the low 1:40s. 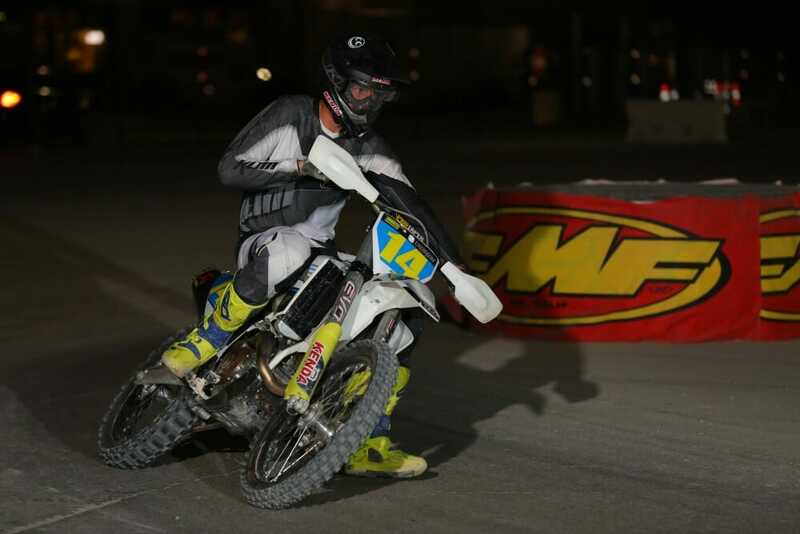 One racer described the race as part EnduroCross and part supermoto. As you can tell, there is nothing ordinary about this one. While Robert and Tremaine squabbled up front, Sutherlin was trying to make amends for a bad start. Tenth after the first lap, Sutherlin picked off riders one by one on his new Suzuki RM-Z450 until he had firm control of third place by the 16th of what would be a 26-lap race. But by that time, he was more than a full minute behind Tremaine. At this point, third place was the best the champ was going to do on this night. Italian Giacomo Redoni (KTM) was the last rider to finish on the lead lap in fourth place. Rounding out the top five overall was former Pro2-class rider Dante Oliveira (KTM). A notable non-finisher was JCR Honda’s Trevor Stewart who was eighth after the first lap, but a big crash on the second lap took him out of the race. Big 6 WCGP Champion Zach Bell suited up but struggled with the unique racecourse and finished sixth after running as high as fourth in the early stages. Former WORCS and EnduroCross champion Ricky Dietrich went from 17th to sixth at the finish. Cooper Abbott led from start to finish in Pro2. In Pro2, KTM rider Cooper Abbott took a wire-to-wire win. He maintained a safe distance over fellow KTM rider Mitch Anderson for much of the race, eventually taking the checkered flag 20 seconds ahead of him. Third place went to Yamaha rider Dustin McCarthy. Spenser Wilton got around Carson Moore on the second lap and then never looked back to take the win in the Pro2 Lites division. The Canadian lapped the entire field in their 16-lap race. Moore went on to finish in second place, while Daemon Woolslayer took third. Brandy Richards (KTM) topped the Women’s Pro class after an intense 16-lap battle with Tarah Gieger. They went back and forth for the lead until Richards took control once and for all on the 10th lap. She fended off Gieger for the remaining six laps to take the victory. Just 12 seconds separated the two at the checkered flag. Ty Tremaine was the only rider able to keep Robert in sight–at least for a while.